Yeah, we have heard this before! Dr. Kevin Folta is a Professor and Chairman in the Department of Horticultural Sciences at the University of Florida. I am going to oversimplify his background (with all apologies to Dr. Folta), but he would be considered an expert in plant genetics including genetic modification of plants. He has been studying this field for nearly three decades, published extensively in real peer-reviewed journals, and has trained legions of graduate students. He is an authority. [infobox icon=”quote-left”]Back in February I received a Public Records Request from a California activist group that demanded my emails back to 2012. This was the first time I ever heard of such things. After 27 years in public science I’d never thought that my emails were anyone’s property other than my own. I had to comply, and did. The story has been covered here and here. My central fear was not revealing incriminating or proprietary information, as the activities of a Professor in a Horticultural Sciences Department aren’t terribly exciting. I was comfortable with university I.T. pulling three years of email from university servers. However, I had one suspicious fear—that this venture was nothing more than a way for activists to spin my statements, and manufacture devious and defamatory narratives, a suspicion that would come true. Why would they target me? I am well trained in transgenic technology, familiarly, “GMOs”. I teach science communication to farmers and scientists, and explain to them how to discuss issues in biotechnology, the risks and benefits, strengths and limitations, with concerned public audiences — something they historically have not done well. 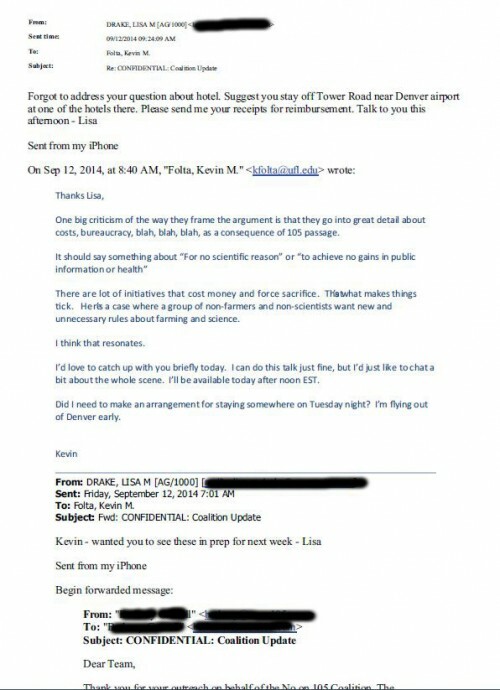 As anyone would expect, the GMO activists pored over the emails to find anything that would put Dr. Folta in a bad light. Anything. And of course, by cherry picking a quote here and there, they tried to tarnish his reputation and scientific knowledge. [infobox icon=”quote-left”]My fears of context manipulation blossomed last week. An entry at PLoS* Biology Blogs, written by Paul D. Thacker and Charles Seife, shows the danger of releasing public records to individuals set to attack professors because they dare to teach a facts in a subject steeped in emotional angst. Awwwww. Climategate–we’ll get back to that nasty tactic soon enough. [infobox icon=”quote-left”]This email was provided from the activist group USRTK) targeting me, and it smacks of journalists asking the activists for a little something to satisfy some ideological agenda. Why else would US-RTK furnish these coveted resources? Not unlike the tactics of the climate change deniers, these anti-GMO activists, in the guise of serious science journalism (I wouldn’t define it as either “serious,” “science,” or “journalism), went on full attack to “prove” (lots of scare quotes, I know) that Dr. Folta was a tool of Monsanto or Big Agra. As a scientist, Dr. Folta decided to respond to some of the ad hominem personal attacks. And remember, those attacks were published on PLoS Biology Blogs–PLoS is trying to convince scientists that it represents a new way to publish data. Yeah, I have an answer to that, and it’s not going to be nice. [On August 6], Nature reported that the University of Florida had provided them with emails that U.S. Right to Know had FOIA’d on one of their researchers. (citation) … the story noted that the researcher has received money from Monsanto to fund expenses incurred while giving educational talks on GMOs…. The article does not report that the scientist has repeatedly denied having a financial relationship with Monsanto. (citation) The article also does not report on an email titled “CONFIDENTIAL: Coalition Update” from the researcher to Monsanto in which the scientist advised Monsanto on ways to defeat a political campaign in California to require labeling of GMO products (citation). (Editor’s note–emphasis from Dr. Folta). I know–Climategate again. I promise, we’ll get to that loathsome tactic used by the right wing climate change deniers over at Fox News. Again, back to Dr. Folta. [infobox icon=”quote-left”]This is the email where the authors claim that I “advised Monsanto on ways to defeat a political campaign in California to require labeling of GMO products” The redactions are mine, as I do not feel it is my place to share email addresses of those corresponding. Now it was crystal clear. The original email was not written by me, despite what Thacker and Seife imply. I did not write “CONFIDENTIAL : Coalition Update”. The note was sent from someone in the No On 105 camp to Lisa Drake, a government affairs person for Monsanto, which the email clearly reveals! It was clear that this was a hit piece. There is no way that any of this shows this email to be my work, and my paragraph in there was critical of Monsanto, hardly “advising”. In September of 2014, Farmers north of Denver had questions about GM technology, safety, and the labeling bill. They didn’t want to hear company led discussion. So Ms. Drake reached out to me, to come speak to the farm group at a private dinner as an independent scientist that knows the topic. She forwarded this “CONFIDENTIAL” email to me, unsolicited. It was confidential because the dinner and discussion were by invite only. And how confidential was it if it was forwarded to me, someone outside of the intended recipients? To address Thacker and Seife’s claims of collusion, it was not a case where “the scientist advised Monsanto on ways to defeat a political campaign in California.” First of all, it was Colorado. Seriously, do these so called journalists think that that email indicates any type of collusion between Dr. Folta and Monsanto? This is what I hate about this gonzo journalism of the modern internet. Apparently, Thacker and Seife couldn’t be bothered by actually doing some fact checking. They couldn’t be bothered by taking time to find some kind of evidence that supported their false claims. His comments seem to be in line with the full context of some of the emails that were made public. Dr. Folta was asking that the discussion about GMOs be based on science, and science alone. This is what many of us say about GMOs–the scientific evidence matters. That’s why the scientific evidence is solidly on the side of the safety and usefulness of GMO foods. Here’s the problem with this bizarrely gonzo journalism from PLosONE–a new trope will arise that Dr. Folta lies about GMOs, that Dr. Folta is a paid shill of Monsanto, and that all scientists are exactly the same, so they are all liars and paid shills (a really bad logical fallacy) of Monsanto. I’m not even a plant geneticist, and I’m constantly accused of being a paid shill of Monsanto. It’s a lame attack that amuses me while I polish the gold bars I received from Monsanto and Big Pharma. And of course, various groups and websites now take the PLosOne article out of context (so it’s like a gonzo context-busting article using another gonzo context-busting article as its source) to support the trope that Dr. Folta is evil. But, as Dr. Folta has said, we’ve heard this story before. Could you imagine if a global warming denialist published an article that said “secret emails from climate change scientists PROVE they lie and manipulate data?” Every climate change scientist, probably some of them who are anti-GMO activists, would condemn the lies. But that’s not just my imagination. It did happen. Climate change deniers (along with vaccine deniers and creationists) have long claimed that there is some massive conspiracy between all the world’s scientists to suppress or fabricate evidence. This ignores, of course, the massive amount of data, accepted by nearly every scientist who is expert in these fields, that supports the consensus. A conspiracy of this level would require all the hundreds of thousands of scientists working together to invent data to show that evolution is true. That global warming is happening. That vaccines are safe and effective. That GMOs are safe. The emails were taken out of context. They do not show any wrongdoing. They do show honest discussion of data and conclusions. They didn’t “trick” anyone or “hide” anything. Groups who are using these emails to misrepresent science–it’s a desperate tactic. These emails showed typical discussions of data by real scientists who were frank and honest. Even if the data discussed was under some sort of statistical or scientific suspicion, it represents a tiny portion of the available data supporting the fact of anthropogenic climate change. But in the world of right wing false-equivalence journalism, Climategate outweighs all of that other evidence. Oh wait, it’s the same for GMO science. Left wing false-equivalence journalism says that Dr. Folta’s out-of-context emails vastly outweigh all of the published, peer-reviewed, scientifically robust evidence that say GMOs are safe. What are they teaching in Schools of Journalism these days? Anti-GMO activists requested emails from a public university sent to and from a renowned plant genetics scientist. Those activists, using unethical journalistic methods, took information out of context to discredit the reputation of Dr. Kevin Folta and of all of the evidence that shows that GMOs are safe. Despite providing scientific evidence that GMOs are safe, Dr. Folta has been highly critical of Monsanto’s anti-labelling efforts. Not exactly a sign of being a shill. The tactics employed by the anti-GMO activists do not differ, in any meaningful way, from the tactics of the climate change deniers. Basically, they search for incredibly fallacious information because they have no evidence supporting their anti-science points of view. They are both desperate groups, and they have no choice but to go on the attack. But irony abounds. 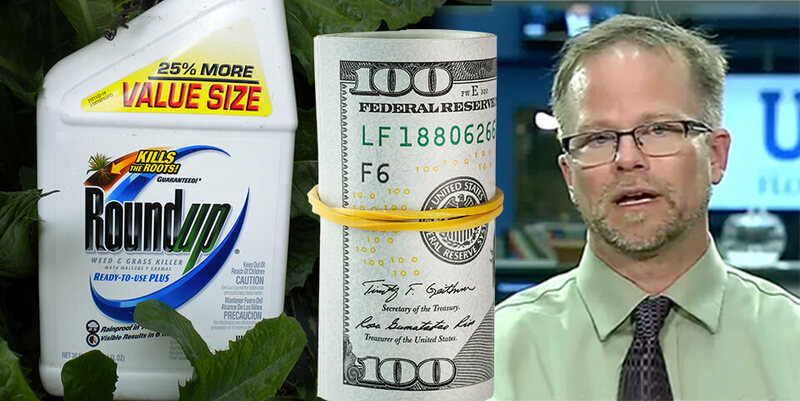 Many of those people attacking Dr. Folta are real paid shill–Big Organic gives them hundreds of thousands of dollars. Once again, my irony meter blows up. Pretty soon, real scientists are going to quit using emails because of these dangerous activists. And that’s going to hurt real science, because science is based upon honest discussion, analysis, and yes, criticism. You can’t do that if everything you write will be taken out of context (or outright manipulated) to further some anti-science cause.